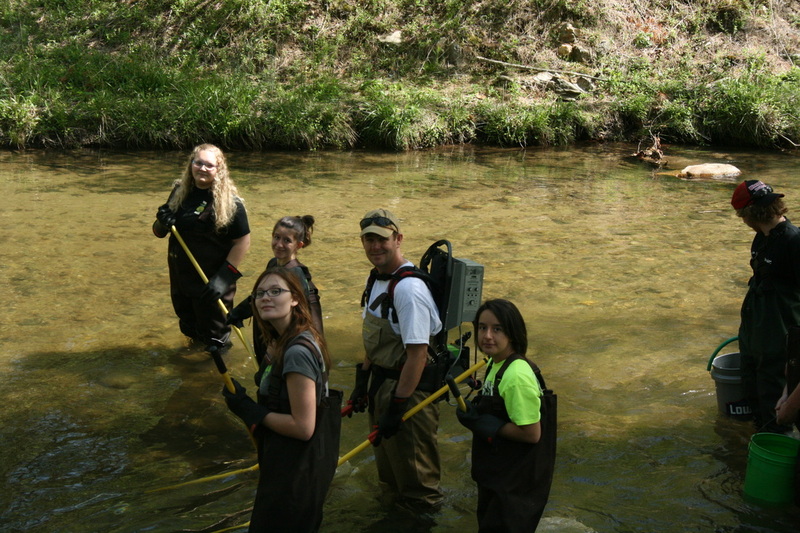 ​Trout in the Classroom (TIC) is an environmental education program in which students in grades k-12 . . .
Electro Shocking for fish species identification. Stream side forestry management & use of a Biltmore Stick to determine the age of trees. Rules and regulations education from NC Wildlife officers. Lunch will be provided both days by the Blue Ridge Chapter of Trout Unlimited chapter. Free time after lunch was spent fishing and exploring the park. ​Stone Mountain State Park is a wonderful place to visit, click the link below to download directions or visit http://www.ncparks.gov/stone-mountain-state-park for more information. We received another $3500 grant from Duke Energy for our TIC program for the 2017 year! It will help us to maintain our Trout In The Classroom programs for our existing schools and help fund our release day expenses. Duke Energy will also participate in this year's release and will assist staff in a couple areas. All the schools have been very successful this year with very little mortality in the tanks. So far, the students and teachers are doing a great job keeping their tanks clean and their fish healthy. Most of the eggs have grown to nearly 1 1/2" long. They have voracious appetites and resemble a school of piranha when fed! Wow... Look at all the little guys! 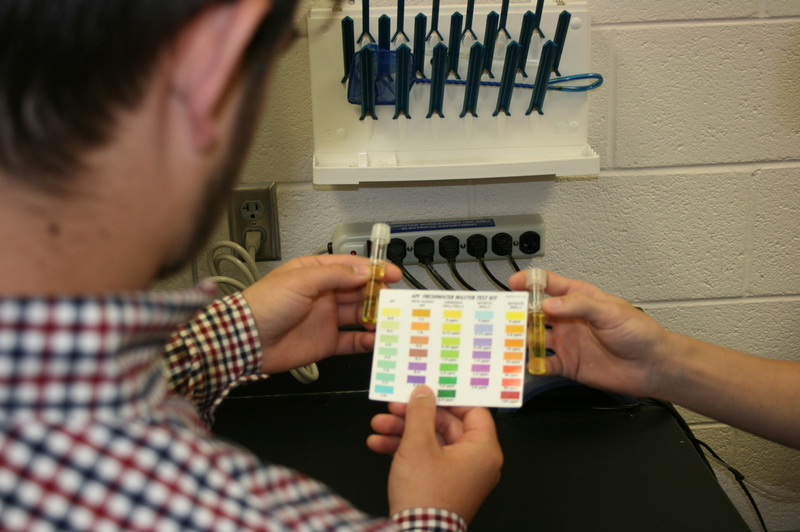 ​The photo to the right is from Ledford High School's TIC tank. These generous sponsors will be volunteering and/or donating supplies for the 2018 TIC release! Don Davidson and Jamie O'Neil accept the official check from Duke Energy on Friday, February 19, 2016 at St. Johns Lutheran School. The Blue Ridge Chapter and Trout in the Classroom were awarded a $3500 grant from Duke Energy for support and expansion of the existing program. This grant will also enable TIC to add two more schools/tanks to the program. We are very thankful to Duke Energy for funding this grant! In addition to the Check Presentation, WXII Newscaster Michelle Kennedy conducted an interview and will broadcast video coverage of this story. WXII aired the Trout in the Classroom story on Monday, February 22, 2016. ​Click here to view the video link. Many thanks to Jamie O'Neil for writing the grant and to all the volunteers who make Trout in the Classroom a success! Trout in the Classroom is a STEM (Science, Technology, Engineering and Mathematics) initiative that allows students to See, Feel and Touch what they are learning. Trout tanks are placed in classrooms and students learn about water quality by being able to monitor PH, Ammonia and Nitrogen. 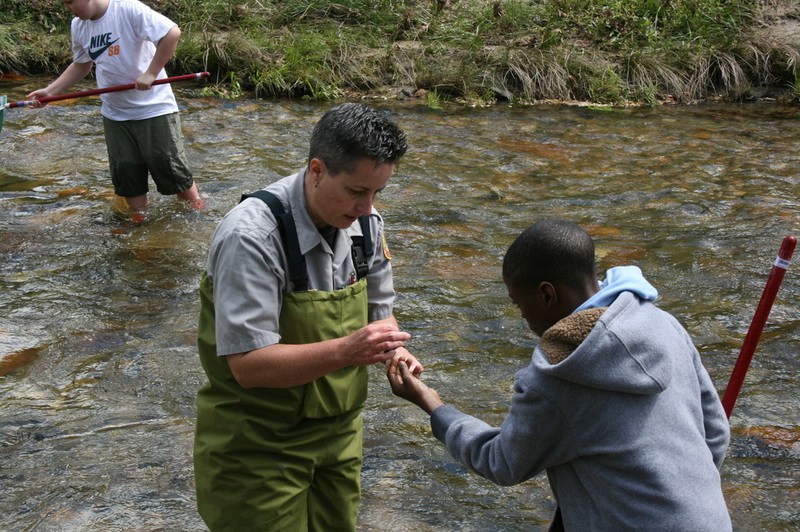 In cooperation with NC Wildlife, Trout Eggs are delivered to schools in the fall of each year. Students begin the TIC year by being able to see the various stages of trout eggs. During the year they get to put their hands on tanks and get an understanding of water quality and appreciation of wildlife. In the spring of each year, students participate in a release day where they spend the entire day in the water learning about water quality. They perform samplings with electrode-fishing and catch nets. They learn about the many types of animals in the water that effect water quality. Visit the national Trout in the Classroom site for a large selection of learning aids and other helpful resources. Fill out the form below if you're interested in finding out more about our local Trout in the Classroom program, learn about sponsorship or to volunteer.